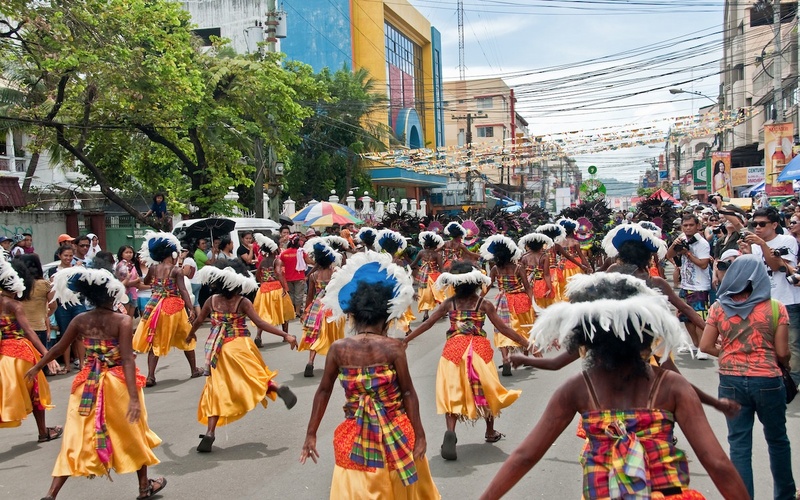 Why Dinagyang Festival should be on every world traveler’s bucket list. Here in the United States, January has a reputation for being a pretty dreary month. We’re still recovering from the hustle and bustle of the holidays, and gray skies and freezing temperatures keep much of the country hibernating indoors. We don’t know about you, but we could use a little color in our lives right now. Where in the world can we turn to for lively street parades, cultural dance-offs, and three days of celebrations? Dinagyang Festival in Iloilo City, Philippines. Forget your winter blues and join us in exploring the sea of colors and thundering drumbeats of the unforgettable Dinagyang Festival. For those more familiar with the culture of the Philippines, you likely know about the Ati-Atihan Festival held each year in honor of Santo Niño, the oldest image of the child of Christ in the Philippines. It’s a long-standing celebration marked by three days of vibrant festivities, parades, and dancing in Kalibo on the island of Panay. In the late 1960s, Iloilo City started bringing people together for their own take on the Ati-Atihan celebrations. In 1977, the city made things official by naming their event Dinagyang, an Ilonggo word that means “to make happy” and encourages revelry and merriment - a sentiment that perfectly captures the spirit of Iloilo’s Dinagyang Festival. For the Ilonggo people, Dinagyang is also a celebration of the arrival of the Malay people on Panay Island, and their purchase of the land from the indigenous Ati people. Held annually on the fourth weekend in January, Dinagyang has grown into Iloilo City’s largest tourist attraction, drawing thousands of visitors from around the world to celebrate the culture and spirituality of the province. Witness one of the greatest parades in the world. What makes the Dinagyang street parade so great? For starters, the colors. With so many tribes getting in on the fun, there’s no shortage of beautiful, colorful costumes for your marveling pleasure. In fact, the festival is a celebration of the vibrant, fun-loving culture of the Ilonggo people and neighboring tribes and groups. The parade brings choreographed dancing, live drumming, and dazzling native costumes to the streets, inviting spectators to celebrate Santo Niño and get in on the fun. Cheer for your favorite team in the ultimate dance-off. Along with hosting one of the best parades around, the Dinagyang Ati Tribe competition is a can’t-miss event during the weekend festivities. This is where teams, or “tribes”, dressed as local warriors face off in a carousel of competitive performances, bringing their best in choreographed dancing, live drumming, and extravagant costumes made with traditional materials. A day before the popular Ati contest is the Kasadyahan Cultural competition, showcasing talent and culture from around the region. These teams are made up of people from different cities and towns in Iloilo, bringing student groups, schools, and community organizations together to celebrate, share traditions, and engage in some friendly competition. Beyond Dinagyang’s main events, there’s so much more to love about this fun-filled festival. There’s Dinagyang’s nearly 7-foot tall mascot, Dagoy and his yearly wardrobe changes. There’s the annual beauty pageant to crown Miss Iloilo Dinagyang. Visitors enjoy all of this against the backdrop of one of the most colorful, rhythmic, and joyful festivals in the world. Ready to kick those January blues and book your tickets to the Philippines? Us, too. Fight that midwinter slump the Mango way and start building your language skills in time for your next big getaway. While multiple languages are spoken throughout the country, learn Tagalog — the national language in the Philippines — to ensure you can explore and travel with ease. You’ll be dancing down the streets of Iloilo before you know it! Click below to find out if Mango is available for free at a library near you.